Assassin's Creed: Revelations will conclude the story of Ezio Auditore de Firenze in the city of Constantinople, but players will need some help from Assassins past and present, too. 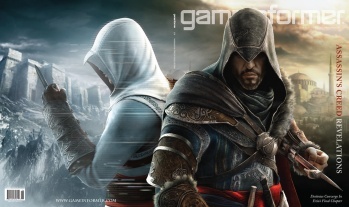 Looks like the rumors were spot on: Ubisoft's next Assassin's Creed is indeed Assassin's Creed: Revelations, and original protagonist AltaÃ¯r will be returning, in a fashion. Today, Game Informer revealed that Revelations will be on the cover of its June issue, and let loose with a smattering of new information about the title. According to GI, Revelations - which, like its predecessors, will be out this November - will focus on AC2 protagonist Ezio and the conclusion of his story. However, it isn't all Ezio, all the time, either. All three of the franchise's primary characters - AltaÃ¯r, Ezio and Desmond - will play a part in the story this time around, and fittingly enough all three of them will be playable. One can hope that Desmond will be less useless than before given the three games he's spent learning from his badass ancestors. Still, the focus will be on Ezio once more as he travels abroad, to the grand city of Constantinople at the height of the Ottoman Empire. Constantinople is, of course, the old-time name of the modern metropolis of Istanbul. Why they changed it, I can't say - one assumes people just liked it better that way. Revelations is also set to have gameplay improvements and new weapons and items - including a tool that will "change the way" players fight and move around the world - but that's par for the course by now. No word on whether the Brotherhood system from the last Creed will be returning, or if there will be something else in its place. Frankly, I'm pretty psyched. Ezio is the best protagonist in the series thus far, and while I'd love to move on to new time periods I'm glad to see that he'll get a proper send-off in this game. I also hope that Revelations will live up to its name and help clear up the notoriously-labyrinthine plot of the series. As much as I loved Ubisoft's rendition of Renaissance Rome, it'll be great to check out the completely new architecture in Ottoman Constantinople. And hey, who knows - maybe we'll finally find out just why Constantinople got the works. Unfortunately, that's nobody's business but the Turks'.